during the week, so, I am limited to weekends. If they had built in Addison which was talked about, even that would have been easier. They should have built in the Rossevelt Road and Canal St. area. With the development of the south loop, would have created an area as desirable as Wrigleyville. Tough to get to as well, but would have made the Cell a tourist attraction, which certainly would have bumped attendance. 2) It's a round peg in a square hole - It's still a suburban-style park, surrounded by a dead zone of parking lots. Undoubtedly if the Sox had built the Cell at Roosevelt and Canal and surrounded it with lots, it would have been a similarly dead area. Sox Park is easily the most accessible of all of Chicago's pro sports arenas, it's next to a gigantic super-highway, and has access to 2 L stations and 1 Metra station within a 10-minute walk. It's not the 2 miles from the South Loop that keeps the neighborhood dead, it's because there's no neighborhood there at all. Bridgeport is slowly becoming the next hip place to be in the city, but that's not going to help the Sox so long as they keep the park surrounded by asphalt. It's a suburban park in the city. There's a reason it doesn't work. Maybe it's because I've spent so much time outside of Chicago, but I have long put accessibilty far above neighbrohoods for a ballpark. Although football ruined Anaheim for a few years and ruined Oakland apparently forever, I think they would be worse without their accessibility. Anaheim doesn't have the mass transit, but it's SoCal and i't's close to I-5 , surrounded by parking. Milwaukee is insulated from its neighborhood and is just off the freeway, whether you're driving from Waukesha or Chicago. It wasn't such a bad neighborhood when I lived outside of Milwaukee, but the the only thing I found that gave it the edge over Phoenix was the effort it took to get to a Diamonbacks game. I never found new Comiskey a bad place to watch a ballgame, even in the upper deck. . Sometimes I see people praising parks for aspects that aren't fan-friendly. Of course, Oakland is such a bad place to watch a ballgame, and San Francisco is such a great place to watch a ballgame that the extra effort AT&T demands is more than worth it. Maybe, but again, there isn't a sports stadium in Chicago more accessible than the Cell; it's incredibly close to the city/transportation network center, immediately adjacent to an enormous highway, and the most easily accessible by all means of public transportation. So while I'm not saying tear up all the lots and put in nothing but residences, obviously something is missing and the fact that Bridgeport has a reputation for being "dangerous and unwelcoming" plays a big part of that. Last edited by doublem23; 04-03-2014 at 02:51 PM. I saw this on another site today, it started out in 1970 when the city was mostly grey representing the middle class, as the years went on the grey turned into orange and red representing much more lower income folks as there was an exodus to the burbs. The city since 1950 has lost one million citizens while the entire metro area increased by over 4,000,000. The change in color doesn't necessarily mean people are moving in or out just that the income in those neighborhoods have not kept pace with the rest of the metro area; the color represent income against the metro area's as a whole, by the time this graphic begins in the 1970s most of the worst damage to the city in terms of suburban flight had already occurred. Also, another major contributor to the decline of Chicago's population is the decline of family size, which is constant across much of the United States. There aren't as many large families any more. I believe the city currently has more HOUSEHOLDS now than it did during its peak population in the 1950 Census. Last edited by doublem23; 04-04-2014 at 09:33 AM. Maybe it's a matter of preference, but I don't know how unique that prefernece really is. I don't even know that it's a minority view. I don't have any problems with the Cell. I liked the access when I lived in Munster. In visiting Chicago later, I liked being able to take the Red Line to the ballpark. I like not having to deal with a neighborhood. People who recall Ebbets Field, the ultimate neighborhood ballpark, point out that it was an effort to get to Dodgers games. There is a debate about the difference between suburban and urban ballparks. Suburban ballparks, which were the trend in the 1970s. Currently urban ballparks are the fasion. But the Cell seems to combine positive aspects of both. It isn't surrounded bars, but I think that's a plus. I don't see how you can draw that conclusion at all. 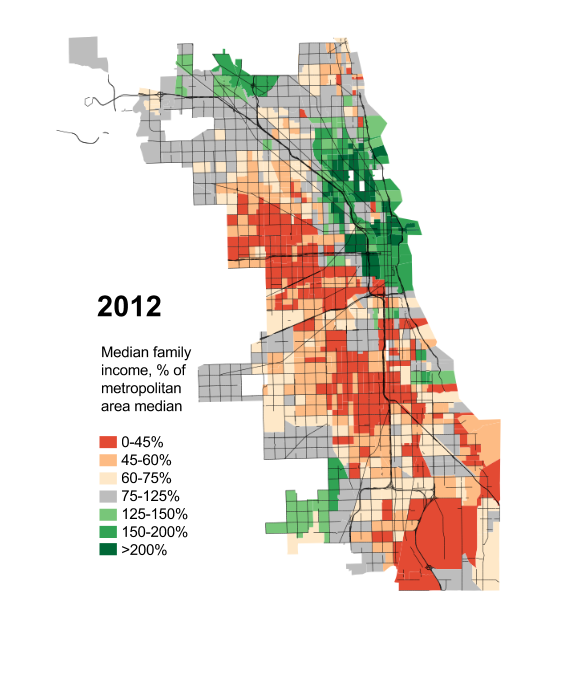 The only difference shown in the maps is an increase of people making more than 125% of the city's median and an increase of people making less than 75% of the city's median. You can't have one without the other. It is not possible to draw a conclusion for how much wealth is in the city from these maps at all, only the increasing disparity of wealth. How much does that change things? Is the increased wealth in those neighborhoods coming from a better distribution of wealth with the suburbs? There isn't enough information present to say for sure, but I see a lot more red and a lot more green and a lot less grey. If there isn't a significant change in the rest of the metropolitan area it doesn't really matter that the median comes from those figures. Well I also know some of this stuff because demographic data for the county is part of my job. Another thing you don't get with this map is overall population, in short, the population of those green areas has exploded (especially in the city center) whereas the population of the red areas has shrunk. The area is definitely on the way up, and if the Cell would have been built only 5 to 10 years later, it would have fit nicely into the redevelopment. Now it sits as a giant hulk in the middle of parking - which will remain since they bring in a hefty amount of profit for the owners (see Miller Park). Of interest to me is the new developments east of the Ryan by IIT. That's a campus of nearly 8,000 students. The new mixed development is also taking shape as well - I park down by the police station on Michigan and stop in for Miller Pizza. All of this despite the piss-poor design and location of the stadium (for the love of all that's good...why does it face AWAY from downtown!??!). They're Cardinals fans down there, with a few Reds fans as you go east. Lake county is pretty 50/50 to be honest. Yeah most of Indiana is Reds, Cardinals. The Cubs dominate most of Northern Illinois, Iowa, and Indiana but surprise, surprise, look who is #1 in the city. The Sox also were the favorites in Will, Kankakee, and Lake County, Indiana. Agreed. Of all the problems that have plagued "New Comiskey" over the years, I think not facing downtown has had a minimal impact on the success or lack of success of the new park. Nobody's saying it's 100% accurate, but given the overall market penetration of Facebook, it's surely a very, very large sample size. Yeah, it's a self-selected sample size, but I rather doubt the percentage of Sox fans who are active Facebook users is somehow larger than the percentage of Cubs fans who are active Facebook users. Unless you think that -- and I'd be quite interested to hear why you think that -- you have to assume that the data is at least crudely accurate.